The Ralph Lauren Style Guide lists the tennis (or cricket) sweater as #4 on the top 10 Spring Essentials for men. Classic style. If he’s ready to tweak his spring style, this sweater offers versatility. Sleeveless is also available. Both go with just about any pants—short or long. Dress him up and dress him down. There are many high-end sweaters out there for $100 and more. No worries, Frugalista Gifts has your back. You might think of Jos A. Bank as only a suit retailer. But, you’d be wrong. Give him the gift of style with this classic, cabled $80 tennis sweater now $40. In white and gray. 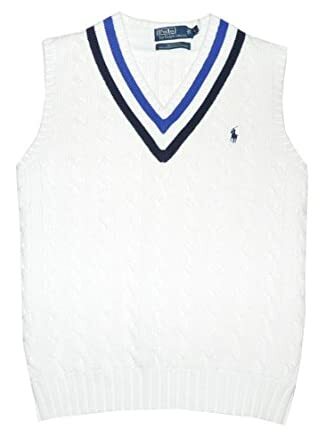 Polo Ralph Lauren Men US Open 2010 Tennis V-Neck Sweater Vest offers a sleeveless variety. Retailing for $125, but available at Amazon for $60. the Spring style. This one in blue, white or brilliant red. Hilfiger also has a sleeveless cricket/sweater vest for $45. Versatility is the theme of The Style Guide. The chambray shirt doesn’t disappoint. It goes from jeans to chinos to casual slacks. Wear it alone with jeans or chinos or add a jacket (even a leather one!) to dress the shirt up. It always puts me in the mind of a man who isn’t afraid of work. Head over to Banana Republic to get on in black, red, or charcoal on sale for $45. The popular grey-blue sells for regular price of $69.50. Or get him the classic grey-blue from Land’s End on sale for $25 (regularly $39.50). LL Bean offers the quintessential blue, as well as faded orange, field moss and light chambray, for regular price of $35. Versatility remains constant on the rest of the list. Wear the pieces alone or layered; and dress them up or down. Items 6-9 include the lightweight knit top, the preppy rugby shirt, the colored chino pants and the Safari jacket. The last item, the Rugged Canvas Bag, serves as a great get-away accessory to hold all his stylish weekend gear. Dress the bag up or down too, depending on whether you gift him with plain canvas or one with leather accents. You’ll easily find gift bargains on the remaining spring essential suggestions. That is, except for the canvas bag. Most of the available canvas bags under $60 look more like messenger or tote bags. Neither really evoke style get-away or quite seem to fit as a spring style essential. 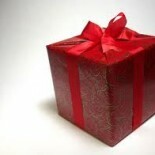 However, don’t despair if this seems the perfect gift for your recipient. Use your tools as outlined in 10 Routes to Bargains – SOCIAL STYLE (Comparison Shopping). Do come back to discover Frugalista prices on the remaining Spring essentials for women. The perfect gift for her might be among them. The 10 Top Women’s Spring Fashion Essentials: The Dresses post details the three versatile, Spring essential dresses. Happy gift shopping for his Spring Essentials! Frugalista style. This entry was posted on April 20, 2012 by frugalistagiftguide in men's, season essentials, Uncategorized and tagged chambray shirt, Frugalista gifts, men's spring essentials, Ralph Lauren Style Guide, rugby shirt, rugged canvas bag, safari jacket, Style Guide, tennis sweater.